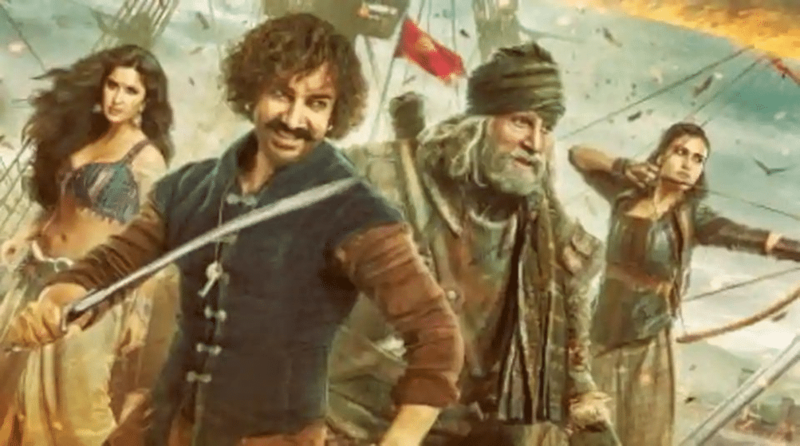 Ever since the official trailer for Thugs of Hindostan released on YouTube on September 27th, 2018, there has been a flood of memes by many social media users, not only mocking the trailer in every way possible but also calling it a ‘copy-paste’ of Hollywood film franchise, Pirates of the Caribbean! From the get-go, the film’s trailer, though getting praises from the Bollywood industry, is also getting a negative response, thanks to the huge similarities between the movie and Pirates of the Caribbean. Especially, Amir Khan-who is called Mr. Perfectionist of Bollywood-is being trolled heavily due to his character’s near-similar looks with that of Johnny Depp’s Jack Sparrow in Pirates of the Caribbean films. Also, other members of the cast like Katrina Kaif and Fatima Sana Sheikh have also become the subject of viral memes. Some users trolled Katrina Kaif for having no dialogue, and just dancing throughout the duration of the trailer. Same goes Fatima Sana Sheikh’s character as well who also doesn’t speak a single word and is seen only performing action stunts. In the film, there is Amitabh Bachchan (in the role of Khudabaksh Azaad), Amir Khan as Firangi Mallah, Fatima Sana Sheikh as Zafira and Katrina Kaif as Suraiyya. There is also Mohammed Zeeshan Ayyub. Apart from the cast and scenes, the VFX in the trailer has come under fire too. As per the fans on social media, the special effects are appearing to be overly scattered and looking less real, considering the humongous budget of Thugs of Hindostan which is about Rs.210 crores! See for yourself below how much love the film is getting from the trollers, meme-makers and most of the Twitter users combined, even before its release, which is still a month away. You will definitely try to resist your laugh, though it’s not guaranteed. When you trust your CTC too much. Thugs of Hindostan is directed by Vijay Krishna Acharya (Dhoom 3) and produced by Yash Raj Films. The film will be releasing on the eve of Diwali, on November 8th, 2018. The Grandeur of BJP Ft. Sambit Patra: The Man Who Knows Everything!